Watch our customers share their experience of a lifetime. Don’t be surprised if all your questions get answered after watching these review / testimonial videos. Our sincere thanks to each and every one of them for being our spokespersons. 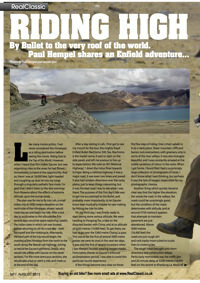 Paul wrote a lovely editorial about his ride experience with us in UK’s Real Classic magazine. Click the image below to download the entire article (PDF format).